Been running a few trips here and there. Started off with some tuna fishing but it got slow and finished up with some killer bottom fishing including releaseing a snapper that bottomed out a 30 pound scale. We vented him though and he swam right back to the bottom. 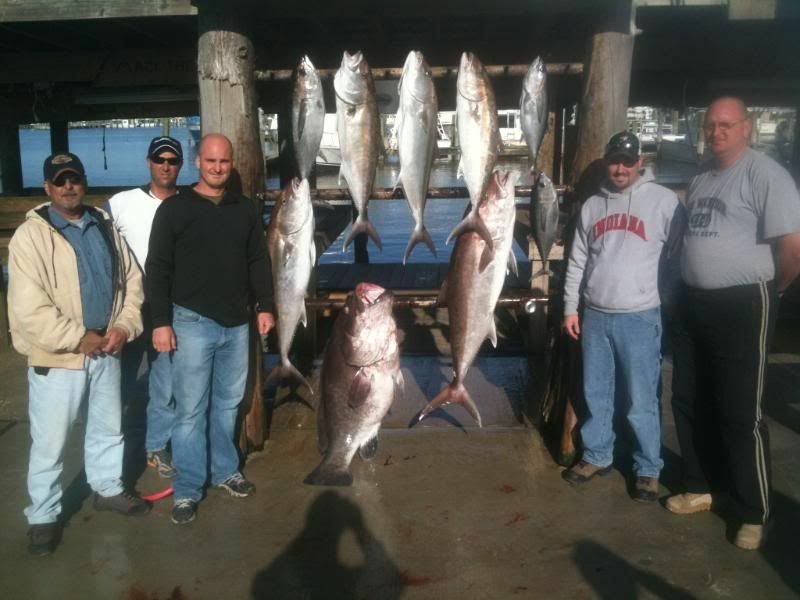 Most of last week I was bottom fishing although we did do some jigging for blackfin. I had the McCandless group in on wed and we started off on the lump. First bait in the water was a chunky blackfin but that was it. We did however catch a big king on a swimbait and I will get back to him later. I decided to run out to a nearby drillship and see what we could round up. 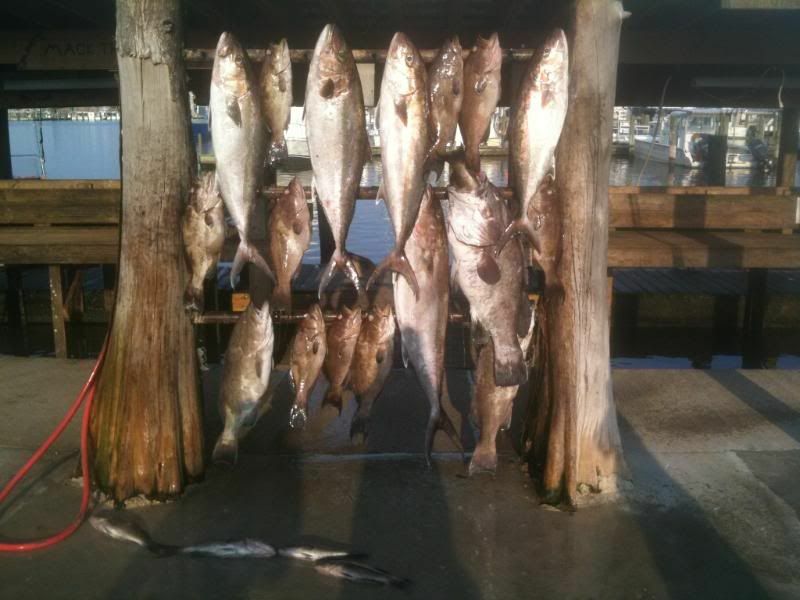 We didnt get any bites on the chunk but added a couple decent blackfin to the box with jigs. The guys were new to fishing but got the hang of jigging quickly and luckily cause there was no live bait to be found. I headed back into the shelf and tried a couple rigs with little success although the 2nd stop did produce a 65 pound aj. The third rig was the charm with jigs though as we added 4 more qaulity ajs to the box and lost about 6 jigs. Gotta keep oti and frenzy jigs in business. After we had out limit of jacks I asked the guys if they wanted to drop one bait to the bottom (400 feet) and they were all in for it so I cut off a nice chunk of our king mackeral and sent it to the bottom on my ole trusty penn 6/0 senator with 250 braid. Bait made it to the bottom and within seconds it was getting thumped and we hooked in less then a minute and I could tell it was a big powerful fish. Luckily we got it off the bottom and around 150 feet up it quit fighting. I liked that as it was probably a grouper and not a shark at that point. Gus was the lucky angler who finished off the fish and it floated to the surface. 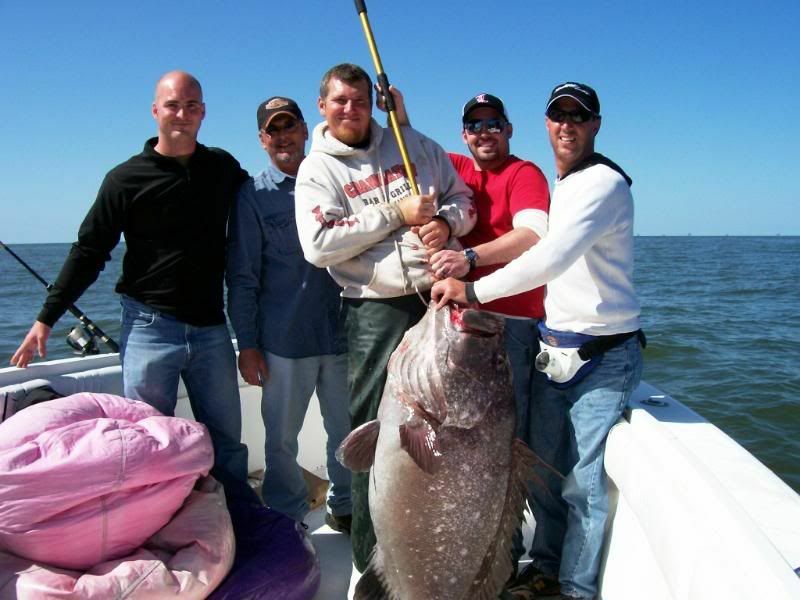 It ended up being the biggest grouper we have landed off my boat as it weighed in at 107 pounds at the dock. 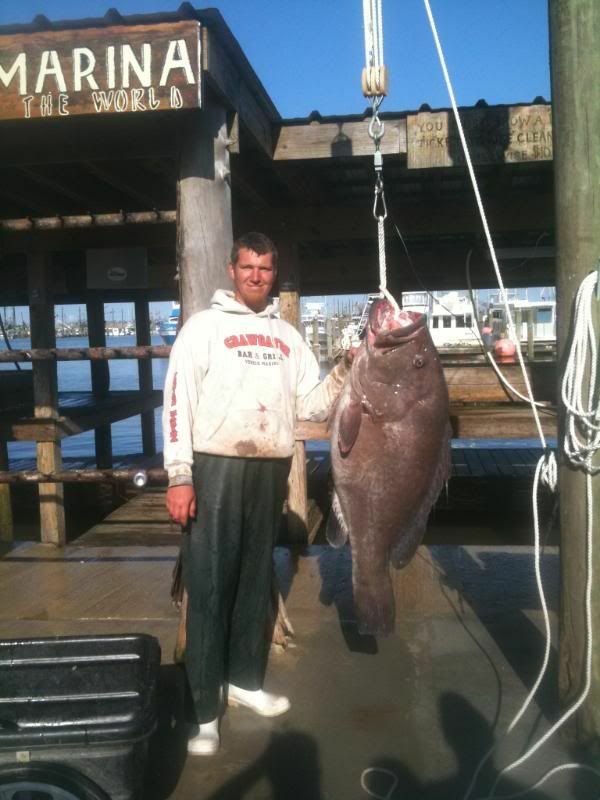 The next day was april fools day and we got to start on our groupers again for the year. Mostly I was planning on trying some tuna and grouper action with a little aj stop sprinkled in. I hit a shrimpboat first thing in the morning that was anchored up and dumping bycatch. Stranglely there was not even a bonito on it although I was marking fish so we dropped a jig and caught a nice blackfin. That was it though so I moved a little farther out to drop some livies for ajs. 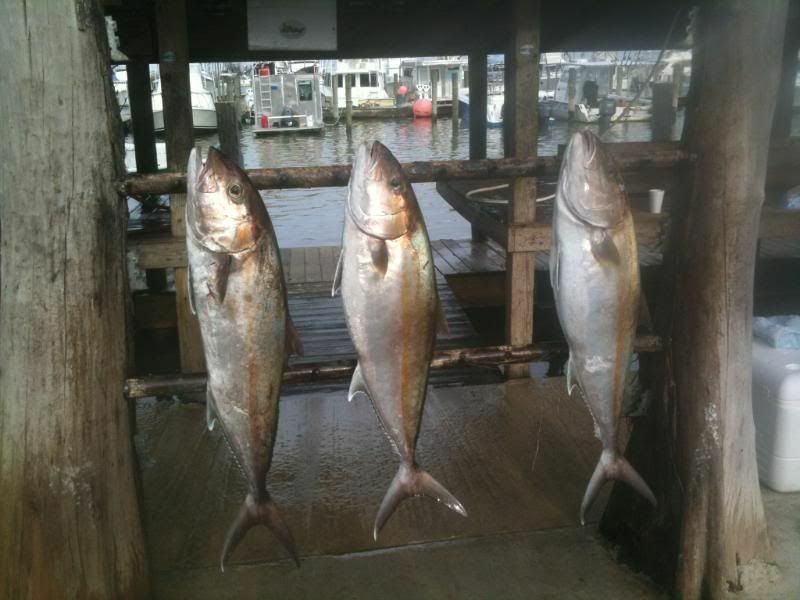 Got our limit of ajs in no time and with no good stuff on the radio about tuna I headed back to our friend the shrimper. Tried chumming again with no luck but we did pull out three more blackfin on jigs before they shut off. I heard from a buddy about a little wahoo bite going on so we pulled around for a while and then picked up a 70 pound hooter on a red/white bomber. 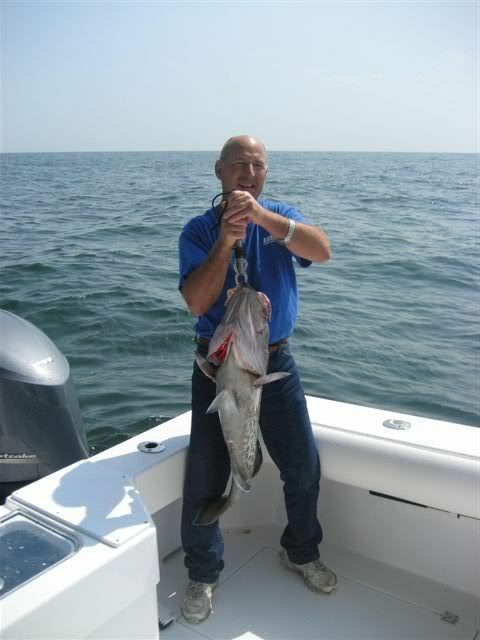 Tried for wahoo a while longer before we dropped bait and jigs for groupers. Picked up 4 scamps pretty quickly before we headed to the house with 5 ajs, 4 grouper, 4 tuna, and a wahoo. I had the pleasure of riding along on Kevin Harmons New freeman as he wanted me along to help with some grouper fishing. 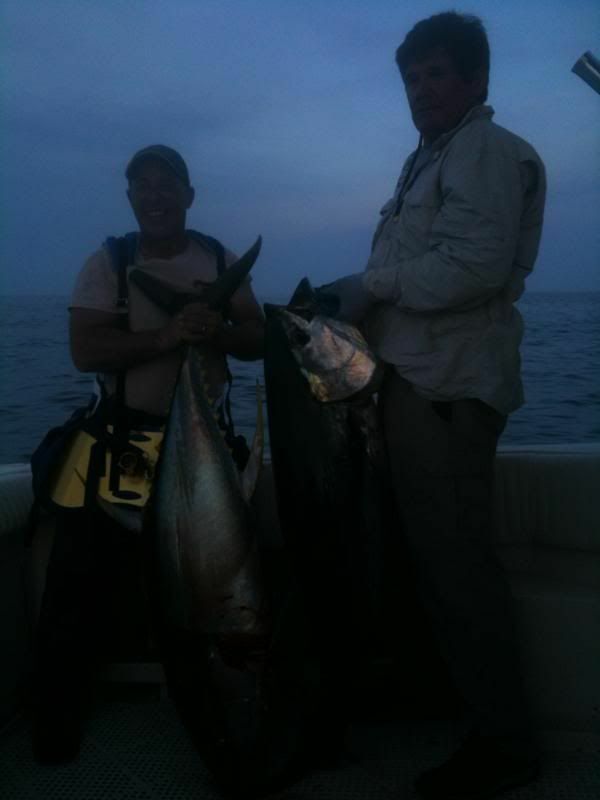 Started off with some wahoo action and no love so we picked up our livies and went to drop for some ajs. 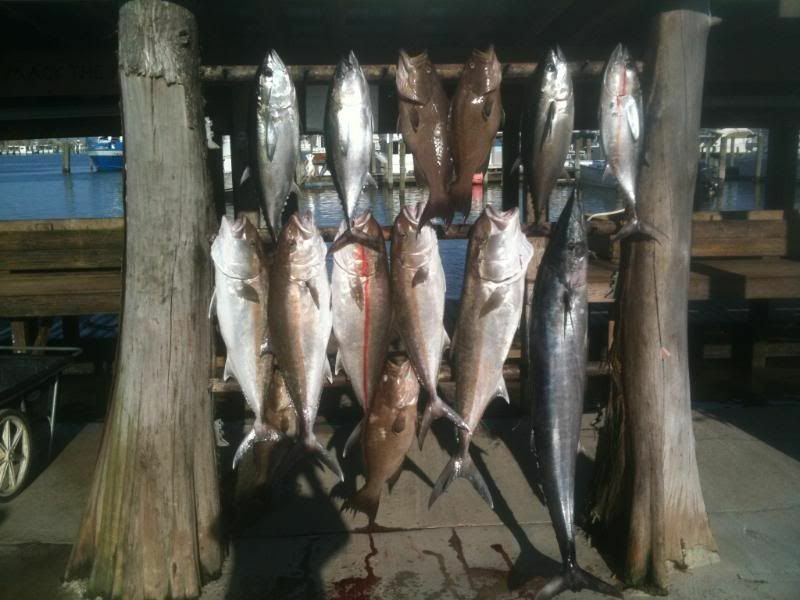 Got a quick limit of 35-50 pound ajs on live bait before we made the move to groupers. First spot was red snapper heaved as we released a handful of 10-15 pounders plus our 30 pound plus one. Made a move and found some groupers. Caught them on a mix of dead bait and jigs and we put 8-9 scamps in the boat there plus one gag. It slowed there a little bit sop I moved a few miles away and got on them again. This was another good place as we caught a few scamps on lucanus jigs and another gag plus a couple scamps on dead bait before big momma showed up to defend her house. 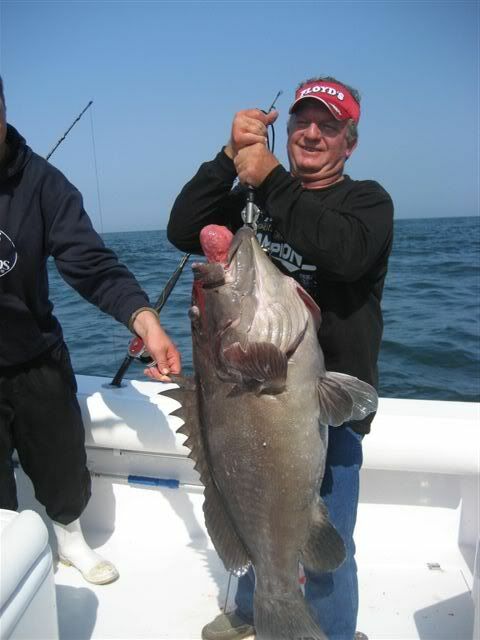 Dean managed to put the breaks on her and landed a 70 pound warsaw to cap our off day as we headed to the dock with 17 groupers and 5 ajs.